All our pumps are Crankshaft type pumps (like a car engine) v/s the cheaper Wobble/Swash plate options commonly available. All our pumps feature full ceramic pistons for unbeatable reliability & long life. All machines feature genuine HONDA engines for unmatched reliability. Manufacturing in-house gives us the unique ability of custom making anything to your specific requirement, like high quality extension lances, Telescopic lances, extension hoses, Hose reels, Rotory Nozzles, Surface Cleaners & many more. Our machines are Guaranteed for quality & durability & come with a 12 months commercial warranty. For commercial purposes we strongly recommend purchasing a water blaster with 2:1 REDUCTION DRIVE. This entails that the petrol engine has a 2:1 reduction drive Thus the pump operates at half the engine rpm - in simple terms HALF THE SPEED IS HALF THE WEAR. In the case of electric machines these are manufactured with a 1450rpm electric motor, single phase or 3 phase rather than 2800rpm which is the more common unit on the market today. 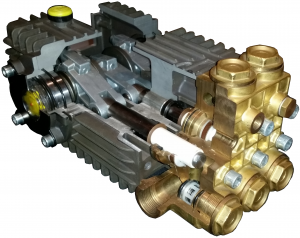 The main advantage being getting the same output for lower wear & tear in a machine with heavy duty components for longer durability and the pump is more easily able to draw water from a stream, pool or water tank due to the slower operation of the pump valves typically reducing the vibration felt through the hand piece. We do also cater for the sporadic user with lower cost machines which are direct drive, these would typically be used by contractors who are not waterblasting full time or for the home user who wants a better quality machine which will stand the test of time. All pump heads constructed of brass for corrosion resistance & wear properties unlike commonly available aluminium.